I think I will try this if I can find all the ingredients. Hi Phyllis - we used only one yeast ball for the 3 cups of rice. I would be hesitant to use a different yeast - the specific strain has a big impact. It might ferment, but it is unlikely to give the result you are looking for. produces a very pleasant flavor." Can you do a continuous brew? You could take some of the residual rice and use that to start another batch. You can't. Yeast is reusable. The mould that breaks down the rice grain't to useable sugar dies from the alcohol. So if you tried to reuse it the yeast wouldn't be able to break the rice grains down into sugars. You'd just gave a stalled fermentation. If you remove some of the Koji (and store in fridge) before putting it in for the ferment then yes you can do a continuous brew, just remember to keep taking a sample of the Koji each time. my mum used to make this. i still have a few bottles of it which was made about 3 yrs ago. The colour has darkened very much. can i still consume it. Hi Anishkar - Yes, it is a wine with alcohol in it from the fermentation. 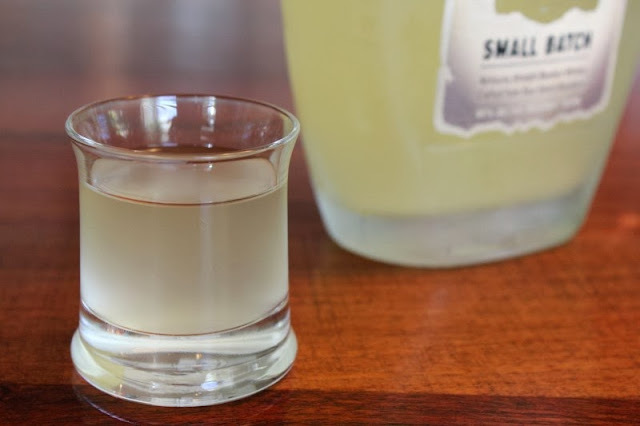 It's not super boozy, but you can definitely taste it. Is possible to substitute medium grain grain rice for sweet rice? I know it's not that hard or expensive to procure sweet rice, but I have about 50 lbs of medium grain rice that I'd like to use instead, if possible. Do you know if this would work? Technically you can uses any type of rice long short white brown black but short gluttonous rice will give the best and sweetest flavor. We've never used anything except the sweet rice, but if I were you I'd certainly give it a try. I've read that Jasmine rice works well, but that long grain rices are harder for the yeast to break down. 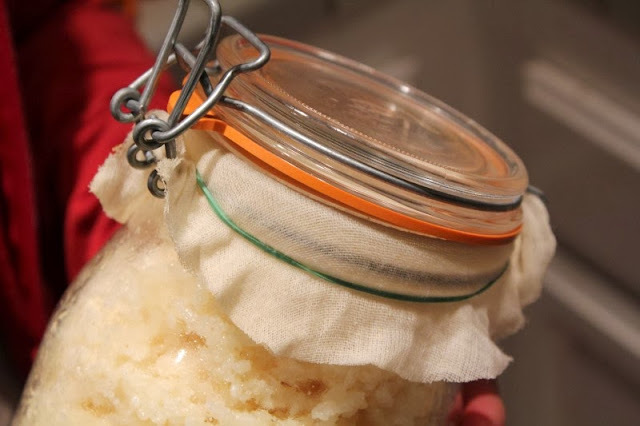 It shouldn't hurt to experiment with a small batch of your medium grain rice and if the result is tasty you can follow up with bigger batches to use up some of your large stash. Hi, I'm making rice wine right now. I wonder how long the wine will be bubbling. Mine started bubbling on the second day and now, on the fifth day, it seems the bubbling begins to stop. I'm afraid that the fermentation stuck. Thanks. 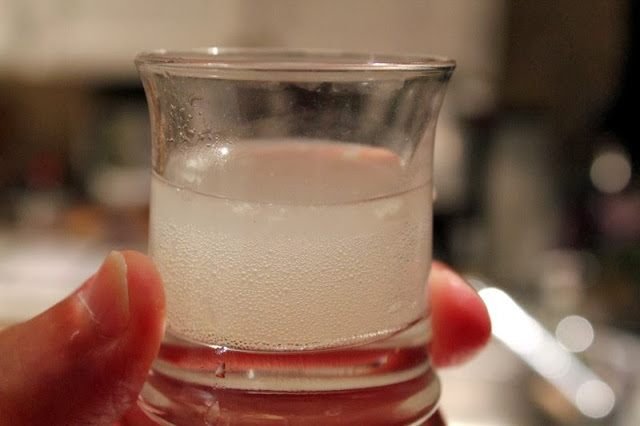 I don't recall how long bubbling is actually visible, but by the time we pull ours (10-14 days), the liquid has lost all it's effervescence (no more bubbles on the tongue). I would suggest that you taste a small sample each day, and see how it changes. Then strain and refrigerate when you're happy. If you're not happy, you can always try a new batch and see if it's different. Glad you're giving this a shot. Hope it turns out well! Can you give a hint as to what section of 99 these were found? It's quite an overwhelming market. Thanks. I know what you mean...! In our local 99 Ranch store (San Diego), they are located in the spice-vinegar-soy&fish sauce aisle. I found them near the spice mixes, almost directly across from the little bottles of sushi soy sauces, but on the very bottom shelf. The package is clear plastic with pink typing. Good luck! Hi just wondering what you do with the leftover rice (after taking out the liquid)? We just throw it away. The taste is not unpleasant, though, and I think some people use it in deserts. My friend from Sabah cooks a delicious chicken dish using lots of ginger and the fermented rice. Oh so delicious..... Must try. They sell fermented rice in sealed jars at the Chinese stores. I guess they are pasteurized otherwise I could use them for yeast. Here's a recipe from kitchen tigress blog. Heat wok till very hot. Add oil and heat till just smoking. Add ginger and stir-fry over medium heat till lightly golden. Add wine dregs and stir-fry till fragrant. Increase heat to high. Add chicken and stir-fry till heated through and wok is stonking hot again. Add wine, then light soya sauce, salt and sugar . Stir thoroughly till wine and soya sauce are absorbed. Add enough water to cover about two thirds of chicken. Stir to deglaze wok. Bring to a boil. Cover and simmer on low heat for about 10 minutes, stirring once half way through. Uncover and increase heat to high. Reduce sauce till thickened. Taste and adjust seasoning if necessary. If it doesn't taste right, it probably needs more sugar. Add more till it tastes good, then adjust the saltiness. Turn off heat. Plate and serve with steamed rice. Add water, cook soup with whole shelled eggs for desert. Or cook with seasame rise power balls for desert. I store it in the fridge and use it to make soups but it can be uses as a form of porridge and as a way to age meat. I'm so sorry to hear your rice has molded! We've never experienced that problem, but I'm sure it could happen. I suggest just starting over since it's inexpensive and a fairly quick process. 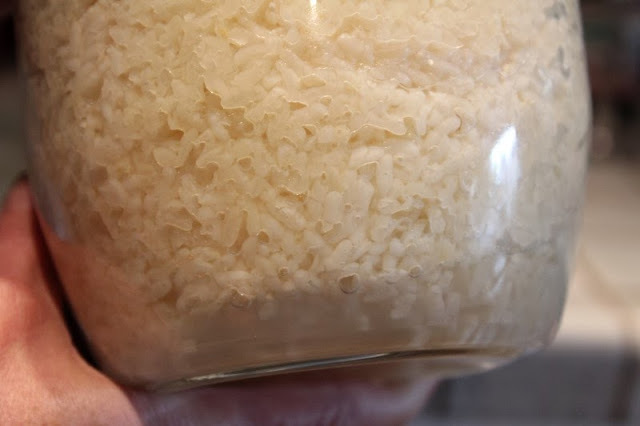 Be sure to sprinkle some of the yeast powder over the very top of the rice to be sure the entire rice mass gets a good start in the fermentation process. As for temperatures, we just leave it at room temperature which in our house is usually in the low 70's F.
If you try it again we'd love to hear how it turns out (good I hope). I wish you the best of luck! I'm not a pro by any mean but usually if there's mold, not good news. Mold is normal depending on the yeast balls you get. There's a number of molds in them that actually provide the enzymes for the yeast to break down the starches in the rice. Depending on the conditions, they may spore out on top. If you get a lot though, then the yeast balls may not have been a good mixture and it can result in unpleasant changes to the flavour. Not necessarily unsafe, just won't taste that good. Thank you for the input. I'll let you know how it all turns out, and try again too. Hi Mike, I am into homemade wine and would like to try Rice Wine but I will not be able to get the rice you use, maybe Jasmine. However, should I not use sugar if I am using other rice? I've been wondering the same thing too! You would have the rice as flavoring and the sugar for alcohol. 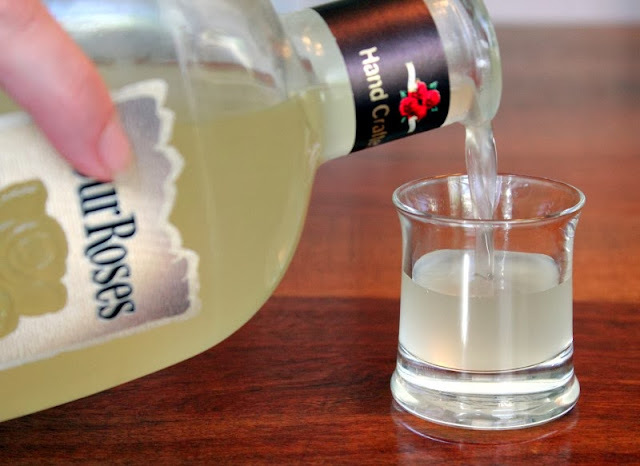 I would try experimenting with a small batch, and see if you like the result. It doesn't take very long. 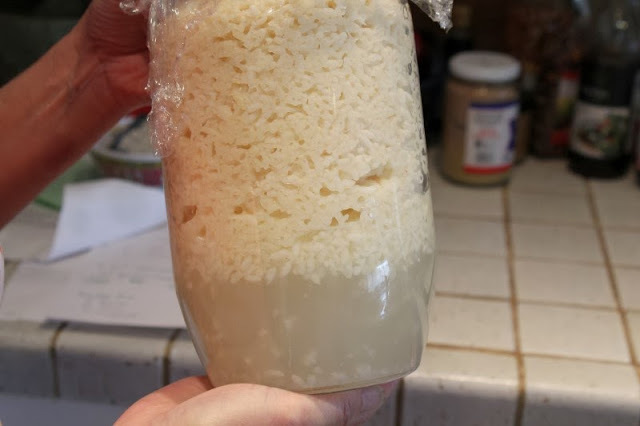 if i want to make 5 liter rice wine, then how much glutinous (Kilogram/gram) rice and yeast i needed. i wanna know all details. if don't find yeast ball in our local market. then how could i made it in my home? is there any alternative ways ? 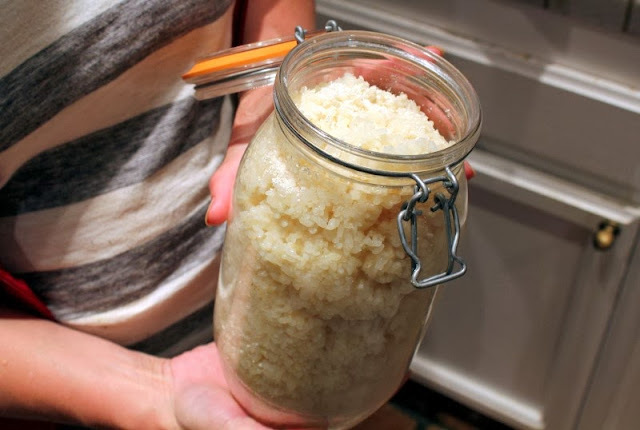 Its tasty, but I really want to know how much calories are in that fermented rice? I'm in the making of rice wine but there's a problem... I have added 50ml of brandy to the ingredients that go in the glass jar, which was actually supposed to go in later after 21 days after straining the rice and raisins. Can you tell me if there's anything I can do about it? Will it ruin my wine making? Should I wait until 3 weeks? or start a new one? Please help!!! I would just let it go and see how it turns out. I make rice wine for our final output this first semester . in what temperature should I store it ? at high or not ? We keep ours in the refrigerator. I store mine at room temp. 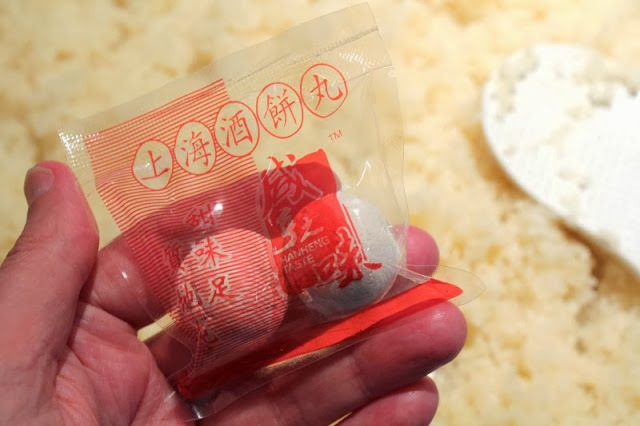 For those who are not able to buy yeast ball for rice wine locally, you can get on the internet and search for "上海 酒饼 丸" and then you can find a seller. They ship world wide.